Funny the things you remember. Memories can be as haunting as any ghost. For instance, many years ago I recall listening to an audio drama on cassette I borrowed from my local library, a spooky tale of which the title sadly escapes me. But the spine-tingling and keep-the-light-on fear were clearly present, a sign that the production values had the right level of suspense. All this time later, and I have not forgotten its power. Every media has its place. And legendary masters of horror Hammer Films has taken us on terrifying journeys in cinema with tales of vampires and zombies, cultists and freaks, murderers and ghouls. In print, too, we have enjoyed adaptations of some of these magnificent stories. It is therefore a pleasure when something new comes along to raise a few hairs and force the lights back on. Hammer Chillers is a collaberation between the Hammer studio and audio masters Bafflegab Productions (formerly Cosmic Hobo, founded in 2006 by award-winning radio producer Simon Barnard), the latter known for work including fantasy and science fiction outings "The Scarifyers" and "Vince Cosmos". Beginning 7th June 2013 there will be a brand new horror anthology available for download, in six parts, with the collection later released on CD (including special bonus material). One of the writers, Stephen Gallagher, commented, "Doesn't matter when you were born, everyone's grown up with Hammer; the company developed a style and a brand that’s become a permanent part of our culture". Personally I am a huge fan of the Dracula/Peter Cushing movies, "Dracula AD 1972" my all time favourite (starring Cushing, Christopher Lee, Stephanie Beacham, Christopher Neame and Caroline Munro). But the Hammer brand has always been something of interest, crypt-keepers of the terrifying, and makers of the finest cinematic achievements in British history; even the "revival" films are sure to become classics. 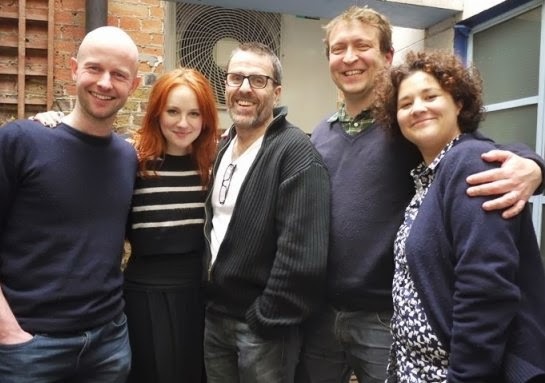 Having listened to the first of these six audios, entitled "The Box" and written by Gallagher, I can only say that there is something wonderful here, a tale of the finest drama starring a fine cast: Con O’Neill, Alex Lowe, Zoe Lister, and Scott Brooksbank. A question is asked, "What is the secret of The Box? ", and indeed that is something the half hour story aims to uncover, as Kim Lavery (Lister) reports that her brother has begun to act very strangely after dropping out of a sea rescue and safety course at the Wainfleet Maritime College after experiencing something rather pecualiar in The Box, an underwater helicopter escape simulator that all candidates must undergo to pass the course. Other titles in this first anthology are: "The Fixation" (written by Mark Morris), "Spanish Ladies" (Paul Magrs), "Sticks and Stones" (Robin Ince), "The Devil In Darkness" (Christopher Fowler), and "Don't Go There" (Stephen Volk). What I admire about "The Box" is its step into highlighting the realities of war, how ghosts of the past never truly leave us, no matter how much time has passed: the memories, regrets, guilt, flashbacks, and how the task of readjusting to every day life deserves much respect. As the character Sean says, "When you see your mates die, it takes more than a bit of work experience to get you through it". The drama is played out well, delivering the right amount of mystery and tension when required. As for writer Stephen Gallagher, he is no stranger to horror having adapted 1991 television miniseries "Chimera" (based on his own novel of the same name), contributed to the "Chiller" 1995 television series, and written the film novelisation of classic sci-fi horror "Saturn Three". Gallagher has also written for "Doctor Who", the TV stories "Warriors' Gate" (1982) and Terminus (1983) - he adapted these into novelisations for Target Books under the pseudonym "John Lydecker".